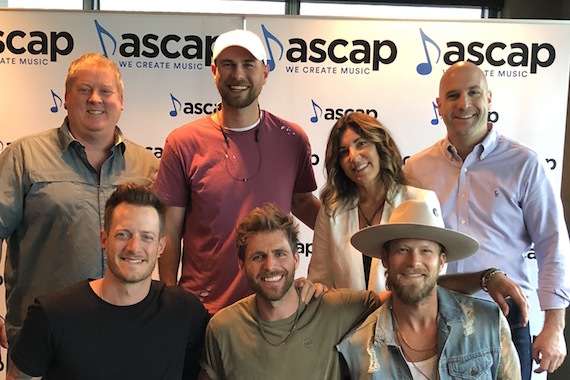 Tree Vibez Music has welcomed its latest addition to the writing roster, with Canaan Smith signing on as the company’s newest staff writer. Celebrating the news at the Nashville headquarters of ASCAP (The American Society of Composers, Authors and Publishers) on Tuesday (May 22), Smith joined TVM founders and Florida Georgia Line superstars Tyler Hubbard and Brian Kelley, TVM general manager Leslie T. DiPiero, TVM creative director/TVM tour manager Adam Romaine, ASCAP senior creative director Mike Sistad, and ASCAP creative director Robert Filhart, to toast the news in laid-back style. A native of Williamsburg, Virginia, Smith earned his first Top 10 hit as a songwriter with Love and Theft’s 2009 debut, “Runaway.” He’s built on that success with more co-written hits including cuts by Jason Aldean, FGL and Cole Swindell, as well as Big Loud Records/Atlantic Records breakout star Mason Ramsey, who has made the Smith co-write “Famous” into a viral smash. As an artist, Smith’s co-written 2014 single “Love You Like That” became a Platinum-certified hit, and his latest single “This Night Back” currently has over 25 million digital streams and counting. Tree Vibez also represents Corey Crowder, Jordan Schmidt, and RaeLynn, as well as James McNair, Cameron Montgomery and Daniel Ross.